Click to view Last night we reported that the U.S. International Trade Commission had agreed to fully investigate the claims made by Hillcrest Laboratories that the Nintendo Wii infringes on four patents they hold for motion-controlled devices. While this doesn't signal decision on merit, it does mean that it's worth a judge's time to take a close look at it. If the Wii is found to violate Section 337 of the Tariff Act, the Wii can be withdrawn from sale in the U.S. We contacted Nintendo for comment last night. Their rather straight-forward response just arrived:"As expected, the International Trade Commission signaled its intention to investigate the importation of Nintendo's Wii and Wii Remote based upon a complaint filed by Hillcrest Laboratories Inc. Nintendo has not yet had an opportunity to respond to the complaint and the commission has not made any determination on the merits of the case," a spokesman told us. "Rather, this preliminary step in the process is based solely on the allegations of patent infringement contained in the complaint filed by Hillcrest. "After a judge is assigned to preside over the investigation, Nintendo will have the opportunity to present its case. 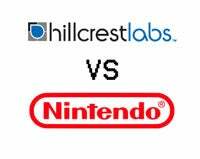 Nintendo respects the intellectual property rights of other companies, and believes that none of its products infringes the Hillcrest Laboratories patents. Nintendo intends to vigorously defend this action."